The holiday season is the usual time for uplifting movies to hit the movie screens, but Unbroken seems like a downer of a concept during the hap-happiest time of the year. Director Angelina Jolie has taken on a huge project the chronicles the life of Olympic runner Louis Zamperini. The challenges the young man faced during WWII says a lot about human endurance, faith, and heart under the worst of times. 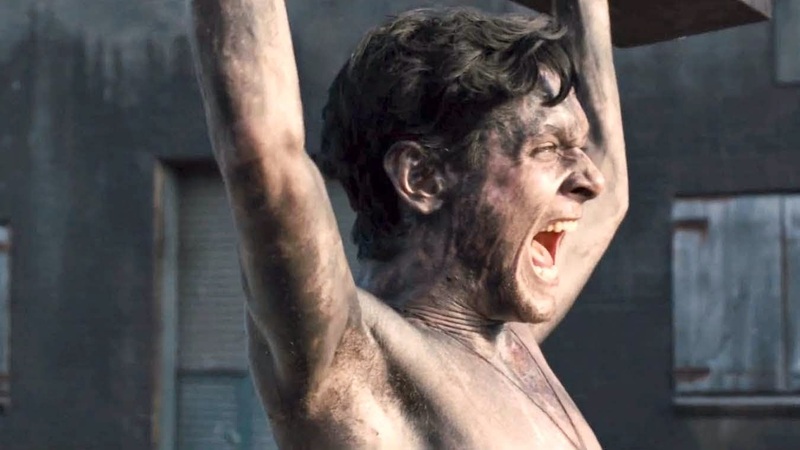 It was adapted from the 2010 book Unbroken: A World War II Story of Survival, Resilience and Redemption by Laura Hillenbrand by screenwriters Joel Coen, Ethan Coen, Richard LaGravenese and William Nicholson. It's hard to understand why Jolie has been hit with a backlash of criticism for her work, which a beautifully photographed and brilliantly acted piece that does honor to Mr. Zamperini who passed away right before the movie's release. Louie Zamperini (Jack O'Connell) was a restless young boy who was bullied for having Italian speaking parents. He was a petty thief, smoke cigarettes and could run quickly when escaping trouble. His brother was on the Torrance track team and encouraged him to run track. The beginning of the flashbacks are filled with quotables that are telegraphed to the audience so you will know that those words will help him later in life. Like “If you can take it, you can make it” and “a moment of pain, means a life time of glory”. Louie has a gift for running, breaking records for high school and qualifying for the 1936 Summer Olympics in Berlin. Serving as a bombardier during the war in the Pacific, his plane went down and only 3 of crew survived the crash. They spent 47 days drifting on a raft in the open ocean. They were rescued but it was by a Japanese war ship which sent them off to a prisoner of war camp in Tokyo. The camp was run by Cpl. Mutsuhiro “The Bird” Watanabe who seemed to take a personal dislike to Louie. The constant beating and ill treatment of the camp prisoners does not show the Japanese in a favorable light which is probably why this movie is not being shown in that country. When the war get to close to their camp, the prisoners are sent to an even more horrific barge mining camp where they are covered in coal dust, working in the cold with little to wear or eat. Watanabe shows up again like a bad penny that keeps trying to break Louie. The movie is mostly about Louie's experience trying to survive, but with also the friendships with his crew member Phil Phillips (Domhnall Gleeson), John Fitzgerald (Garrett Hedlund), Mac Mcnamara (Finn Wittrock) and Cup Cuppernell (Jai Courtney). Yes, it's a tough movie to watch when it comes to picking something out to share with the family, but it's an inspirational film of a remarkable man.